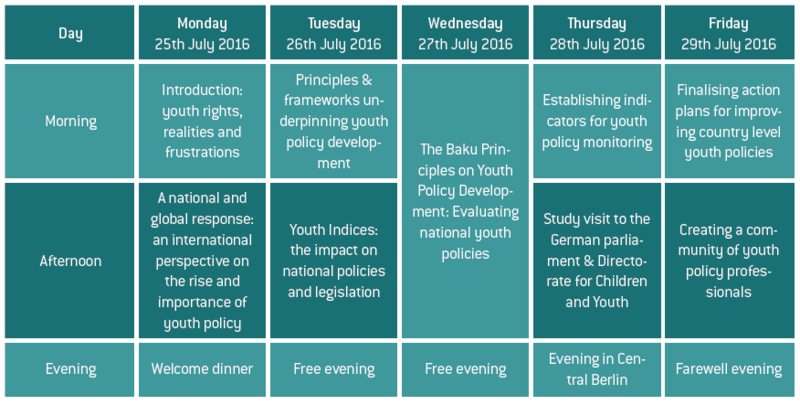 In 2016, we will host the inaugural Youth Policy Labs Summer Academy in Berlin, Germany from the 24-30 July! For 30 international participants, the Academy is designed to ensure that the professionals responsible for young people are skilled, knowledgable and able to implement effective policies at a national level. For full details go straight to our full Academy brochure or keep reading below. The challenges facing young people today are massive. Whether it is youth unemployment, low-quality education, lack of healthcare, civil conflict, violence and abuse, or political repression, the issues impacting on the lives of young people are complex and increasing. From the halls of the United Nations to the streets of capital cities around the world, young people frequently remind us of their powerful ability to react when governments fail them and their determination to achieve a better life for themselves, their family and their communities. In response, governments and parliaments are increasingly seeing national youth policies as the vehicle through which to channel and mobilise resources for young people. For these to be effective, highly-skilled and professionally trained staff within governments and international agencies are required to transform policies into practical improvements in the lives of youth. Delegates at the 1st Global Forum on Youth Policy, where Youth Policy Labs was the Technical Partner. The First Global Forum on Youth Policies, hosted by the UN Secretary General’s Envoy on Youth, UNDP, UNESCO and the Council of Europe, was an important milestone for the youth sector. With a renewed political commitment to youth policy development, the Summer Academy aims to support practitioners in the technical aspects: designing, implementing and evaluating youth and public policies. That’s why today we’re launching the Youth Policy Labs Summer Academy! Click here to read the full Academy Brochure. The Youth Policy Labs Summer Academy aims to ensure participants leave with a clear plan, a network of supporters and the knowledge needed to make decent policies for young people happen. In order to strengthen and build the capacity of professionals working on youth policy development, the Academy will provide the latest thinking, tools and best-practice when it comes to responding to the needs, challenges and aspirations of young people. The programme will include technical input from our team of youth policy practitioners and we’ll be joined by leading figures from the international youth sector for expert input. This will include senior officials from the United Nations, parliamentarians, academics and activists. 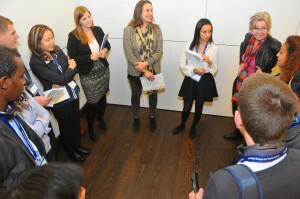 The Academy will include a mixture of presentations, workshops, group work and individual study. Participants will spend time in smaller learning groups at the start and end of each day to reflect on learning and challenges throughout the week. The facilitators will adopt a non-formal approach to learning, with the experiences of other participants used to strengthen the development of the group – complementing the more formal, lecture style inputs. The programme is subject to change and will be shared with participants in advance. The programme will be conducted entirely in English. We will host a welcome and farewell party and will spend one evening in central Berlin outside of the training venue. We want to create a week of intellectual engagement, but in a friendly and supportive atmosphere. The Academy is designed for those who play a leading role in the design, implementation and/or evaluation of national youth policies, strategies or public policies that directly impact on the lives of young people. The Academy will take place from the 24th- 30th July 2016. Participants will be expected to arrive into Berlin by Sunday 24th July, with accommodation provided from that night. The 25th-29th July will be full working days, with an anticipated day running from 09:30 – 18:00. Participants will be required to check-out of the hotel on Saturday 30th July. The Academy will take place at “Seminaris Campus Hotel Berlin” with the training and accommodation both on campus. The campus is located in Berlin, around 30 minutes from the city centre. The venue has a university campus atmosphere, with modern facilities and an excellent training environment. There is a gym, lounge bar, and outside leisure area – perfect for the summer weather! Participation in the Academy costs 2250 EUR, payable in advance. For the full cost breakdown – particularly on what is and what is not included in this price – please see the full Academy Brochure. Those selected to attend the Academy, and those placed on the waiting list, will be notified by 15 April 2016. Following this an invoice will be sent for a 20%, non-refundable deposit (€450), which is payable by 11 May 2016. If payment is not received by this date, your place will be given to someone on the waiting list. The full tuition payment must be received by 7 June 2016. Your place on the Academy is only secured when the deposit payment has been received. For more information contact Alex Farrow at alex@youthpolicy.org.